At least 38 children will be reunified ahead of a Tuesday deadline, and a federal judge called on the government to speed up parental vetting processes to reunite 26 more with their parents by the end of the day. The federal government expects it will have reunited at least 38 — and maybe more than 60 — immigrant children under 5 with their parents by the end of the day Tuesday, but that means it could miss Tuesday's court-mandated reunification deadline for dozens of toddlers who were separated from their parents after crossing the U.S.-Mexico border. In a court filing midday Tuesday, the government said it has identified 102 kids under 5 who were separated from their parents. Four of those kids are already back with their family members — three with their parents, and one with an adult sibling with the parent’s consent. Another 34 "are expected to be reunified" on Tuesday. And 16 more have parents who cleared a criminal background check "but the process for verifying parentage has not been completed." Those kids are expected to be reunified "on July 10, 2018, or as soon thereafter as parentage can be verified," the filing reads. One more child has a parent who has a background check that should be resolved Tuesday. That leaves 47 other children likely to remain separated after the deadline. The government gave varying reasons for that. Twenty-six of the kids aren't eligible for reunification, mostly because of worries about abuse or because their parents have criminal histories or are currently in criminal custody. One other child can't be reunified because the child's parent has been missing for more than a year. In the court filing, the government acknowledged that "records show the parent and child might be U.S. citizens." Another 20 are eligible to be reunified with parents, but the government has encountered logistical barriers that are slowing that process. Twelve of those kids have parents who have already been deported. The government is working to contact those parents and figure out whether they want their kids to be reunited with them in their home countries. The other eight children have parents who were released into the United States. 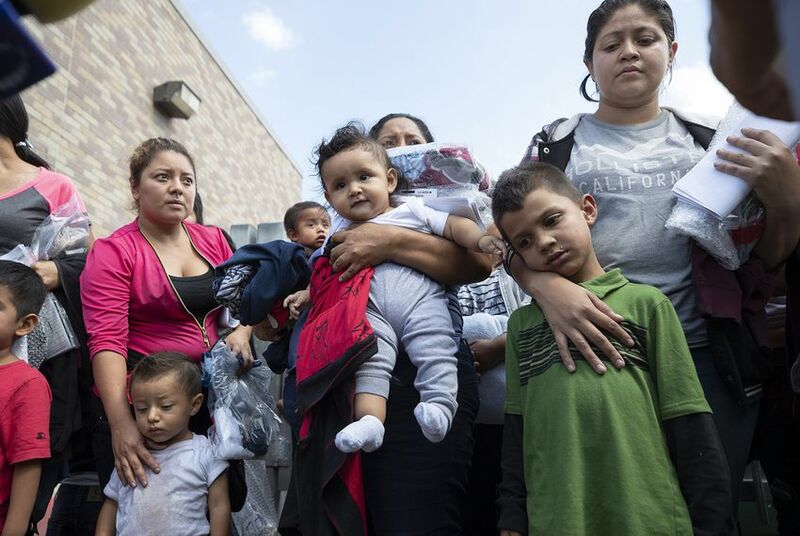 Chris Meekins, deputy assistant secretary for the U.S. Department of Health and Human Services, stressed in a phone call with reporters that his department is working hard to comply with the deadline and keep the children safe. "Our process may not be as quick as some would like, but there is no question that it is protecting children," he said. That process involved matching DNA samples between children and adults claiming to be their parents, verifying print records proving parentage and checking with each child’s case manager for any indicators that the child was previously abused. At a hearing Tuesday, Judge Dana Sabraw of the U.S. District Court for the Southern District of California approved streamlined vetting procedures to speed up the reunification process, relaxing DNA testing requirements and waiving background checks on other members of the child’s household. Sabraw said that under these protocols, he expects the government to reunite 63 kids in total with their parents by the end of the day Tuesday. But once reunited, families may still find themselves in ICE detention centers. At a Monday hearing in the San Diego court, government attorneys said ICE would release families after reuniting them, since the undisclosed facilities where reunifications are taking place were not built to house minors. Since then, though, the government has suggested that this may not always be standard protocol. Los Angeles-based U.S. District Judge Dolly Gee rejected Monday the Trump administration’s request to overturn the Flores settlement, a 1997 court agreement that bars the government from detaining children for more than 20 days. But at Tuesday’s heading in San Diego, DOJ lawyer Scott Stewart said the government did not interpret Gee’s decision — or Sabraw’s court order — to mean that immigration authorities must release detained parents. Instead, Steward said, government officials interpreted the orders to mean that the government has the right to give parents two options: to either waive their children’s Flores rights and remain together in detention centers, or to consent to release their children to sponsors and become separated once more. “In neither circumstance would the parent be able to use this court’s order, together with the Flores court order, to bootstrap a right to release, a right to force the government to allow parole, that sort of thing,” Stewart said. Even if the government does not start separating families again now, that interpretation of the California court orders leaves open the possibility of doing so in the future — and Stewart made clear Tuesday that the Trump administration would challenge alternate interpretations that closed that door. “If we’re put to the choice where we’re forced to release parents, we’ll need to evaluate options,” he said. Meanwhile, President Donald Trump on Tuesday placed the blame for the delays on the parents and kids crossing the border. "Well, I have a solution: Tell people not to come to our country illegally," he told reporters on the White House lawn. Trump declined to directly answer a question about whether he intended to punish immigrant children, instead re-emphasizing his message of deterrence and defending federal immigration authorities. "I'm saying this, very simply: We have laws. We have borders. Don't come to our country illegally. It's not a good thing," he said. Most of the children were first taken from their parents as part of the Trump administration's "zero tolerance" policy, which referred all immigrant adults apprehended at the border for criminal prosecution. Since children can't be prosecuted, they were separated from their parents and taken into government custody. Amid widespread public outcry, Trump ended the practice of splitting families via executive order in June — but more than 2,000 children had already been separated from their parents. Sabraw ordered last month that the federal government reunite children under 5 with their parents by Tuesday, and older children with their parents by July 26. At Tuesday’s hearing, Sabraw asked the government lawyers to explain Thursday why any of the 75 children under 5 who qualify for reunification have not rejoined their parents. Sabraw said he will convene regular hearings as reunifications for the under-5 group continue — and a July 26 deadline for reuniting older kids with their parents looms — to receive updates on the government’s progress. “The court is holding the Trump administration’s feet to the fire to get these kids reunited with their parents. That’s the most important thing. It’s extremely disappointing the government will not be in full compliance with the court order, but the judge has stepped in to manage this mess of the administration’s making," American Civil Liberties Union attorney Lee Gelernt said in a statement Monday.